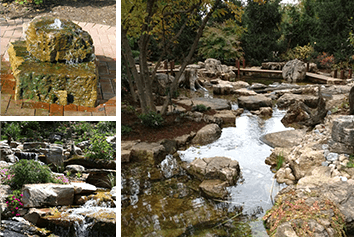 Nature's Re-Creations is a design and installation company in St. Louis that specializes in natural water features. We build water gardens, koi ponds, natural swim ponds, waterfalls, pondless waterfalls, custom bubbling rocks and rain water harvesting systems. By utilizing very large, weathered boulders to mimic natural settings, we strive to provide our clients with a feature that is truly carved from nature. Professional service and guaranteed workmanship are at the center of our core values and our goal is to be the best contractor you have ever worked with in St. Louis.